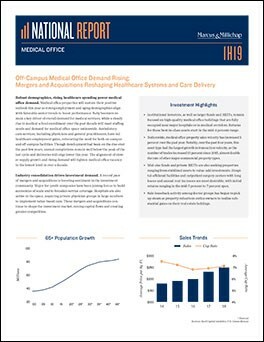 A wave of mergers and acquisitions, along with rising demand from aging baby boomers has powered tremendous improvement in the medical office space. Investment demand has kept pace, with investors eyeing attractive yields compared to other commercial real estate sectors. As a service to our clients, Marcus & Millichap provides research reports through the Research Services page of Marcus & Millichap.com.